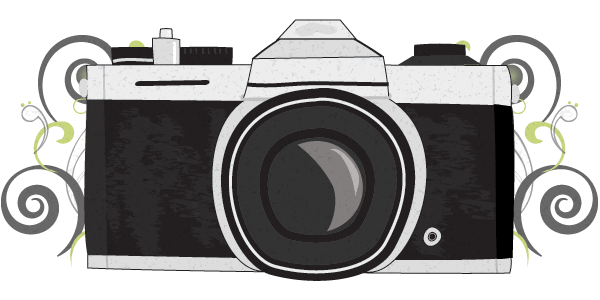 Just Another Way To Get Things Out Of My Head…..
Like some of you I am addicted to Pinterest. 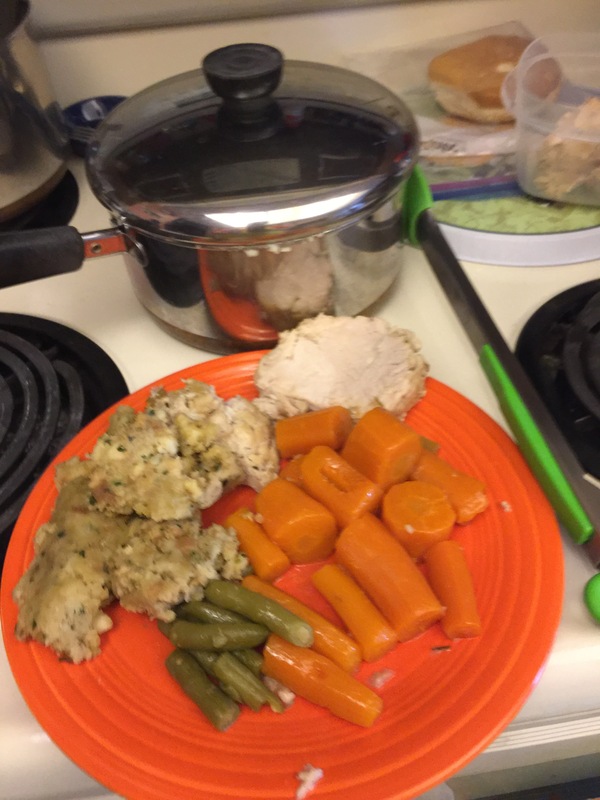 Now that I have a pressure cooker I have been searching Pinterest for different quick meals. 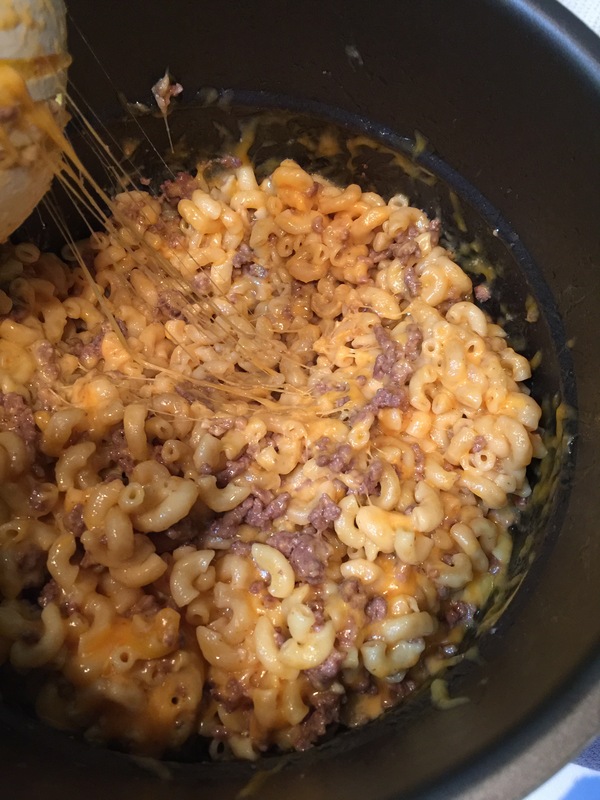 I came across a homemade hamburger helper recipe. Thought I would give it a shot! Perfect! 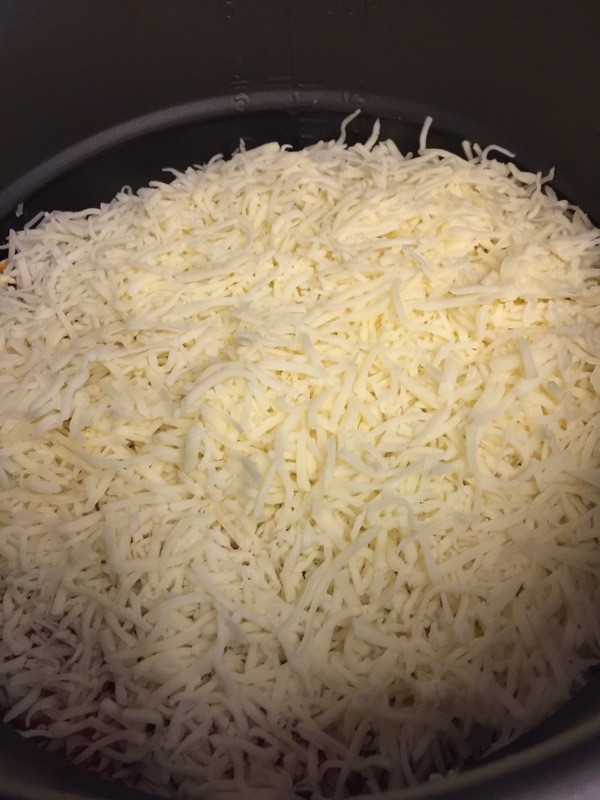 Add the cheese and serve. 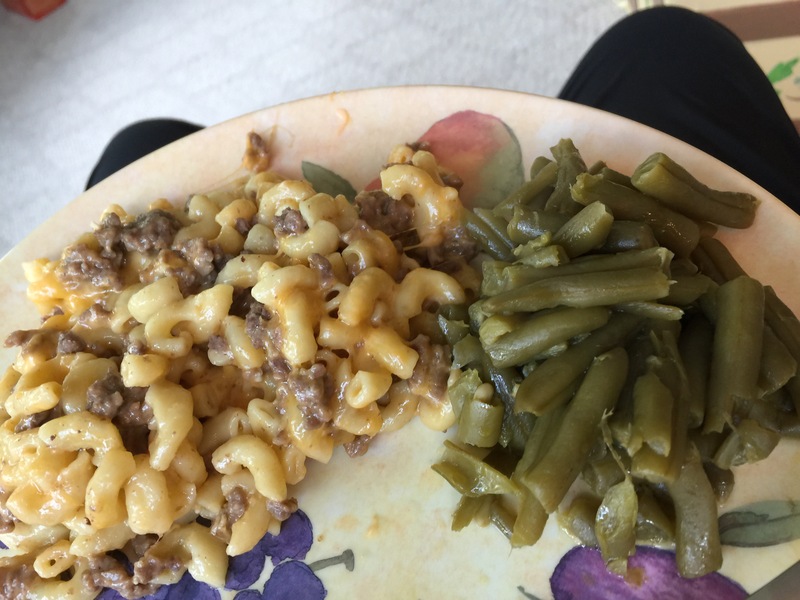 I made some green beens to go with it! And dinner is served! 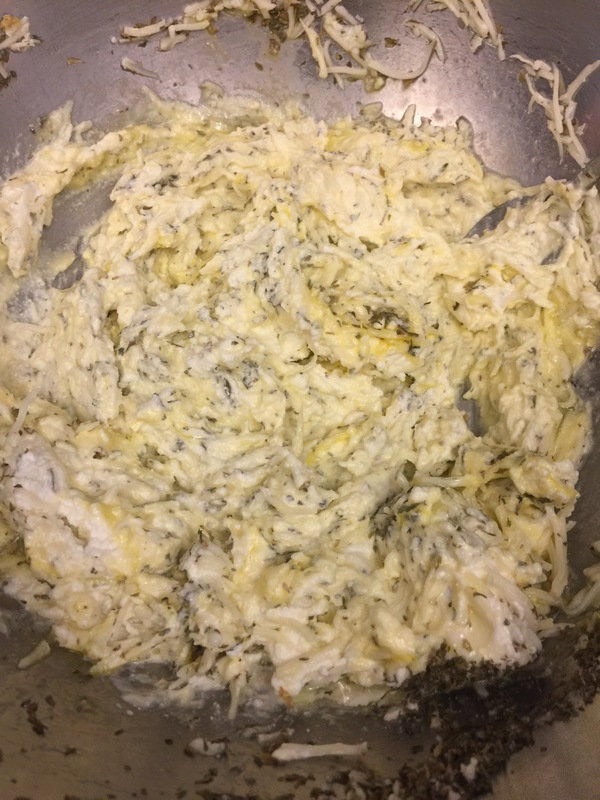 Could I have made this in the stove? Yes but I must say I only have one pot to wash! I also didn’t have to babysit the meal! We will make this again! 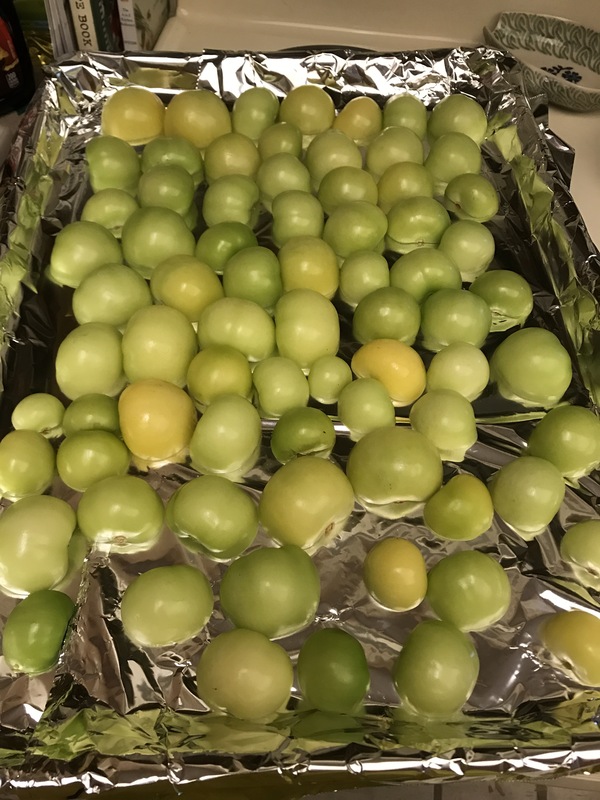 This spring I planted tomatillos in the garden. 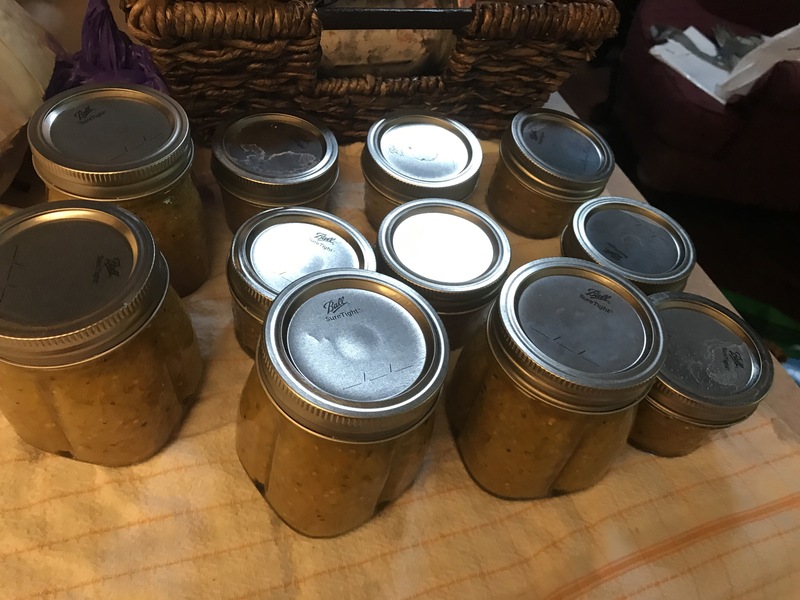 I went out to the garden and got all the ripe tomatillos off the vine. 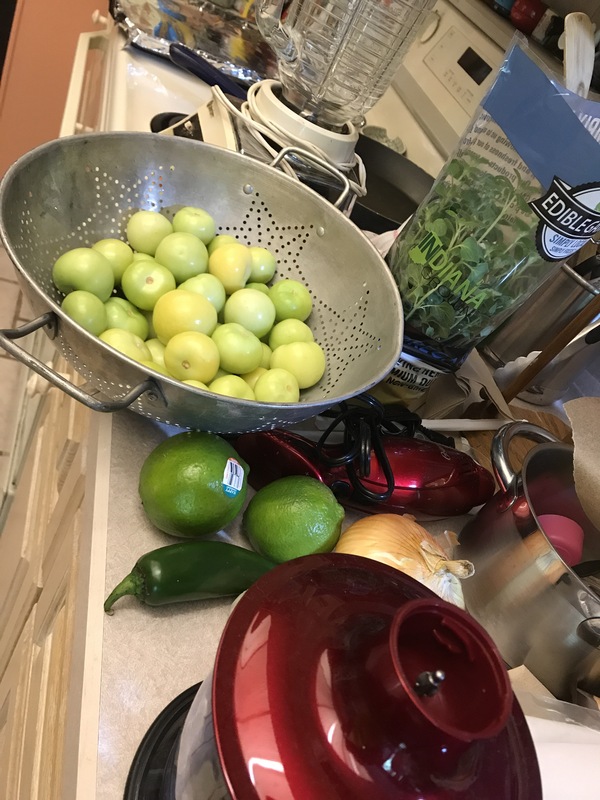 So I gathered the ingredients I needed to try and make Verde Salsa. I got out the blender and the food processor to help chop things up. 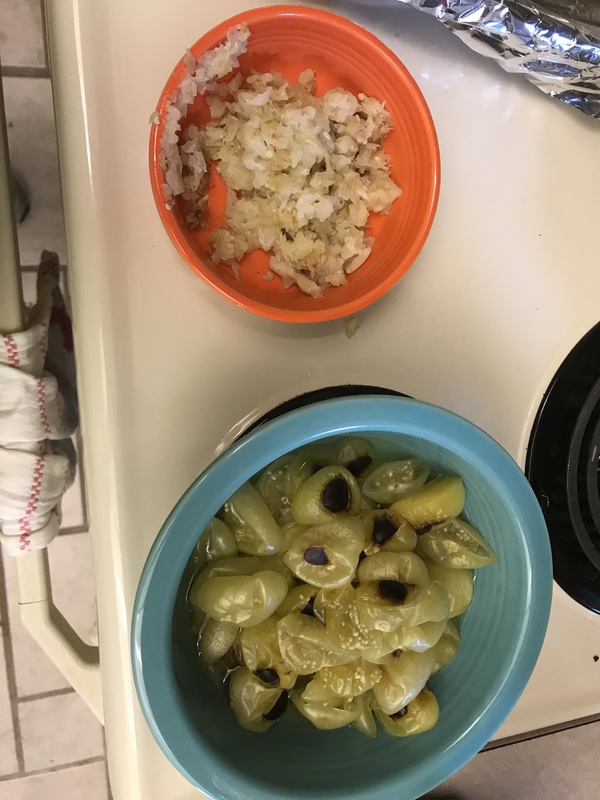 I cut the tomatillos in half and roasted them cut side down in a pan that I covered with aluminum foil. I figured there would be juice and I was right. I put them in the oven on broil for 7 minutes and checked them. Ended up putting another minute and a half on them. While this was going on I sautéed some yellow onion and garlic. Cooked till it was translucent and then sat both the tomatillos and the onions aside to cool off. I put them in a bowl. 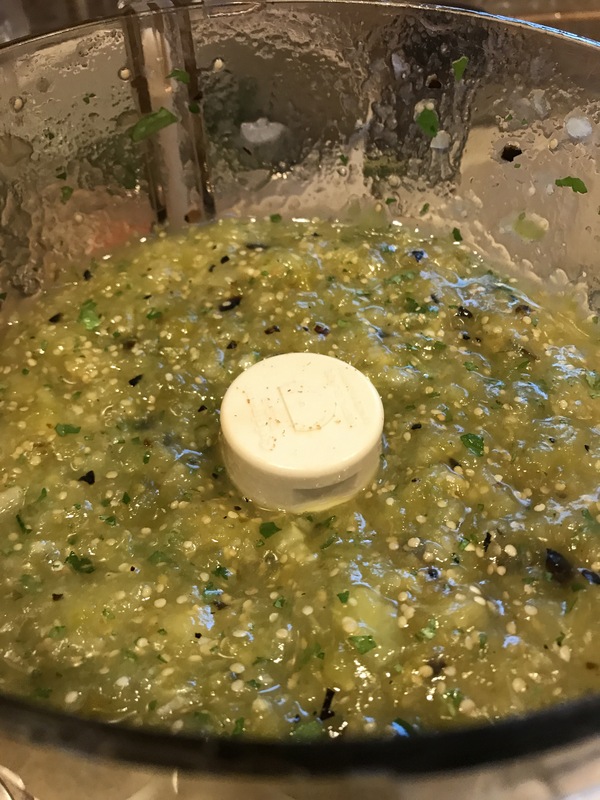 After taking the tomatillos off the pan I poured the juice into a bowl just incase I need to make the salsa more saucy. Then I put it all in the food process (was gonna use the blender but didn’t think it was big enough. 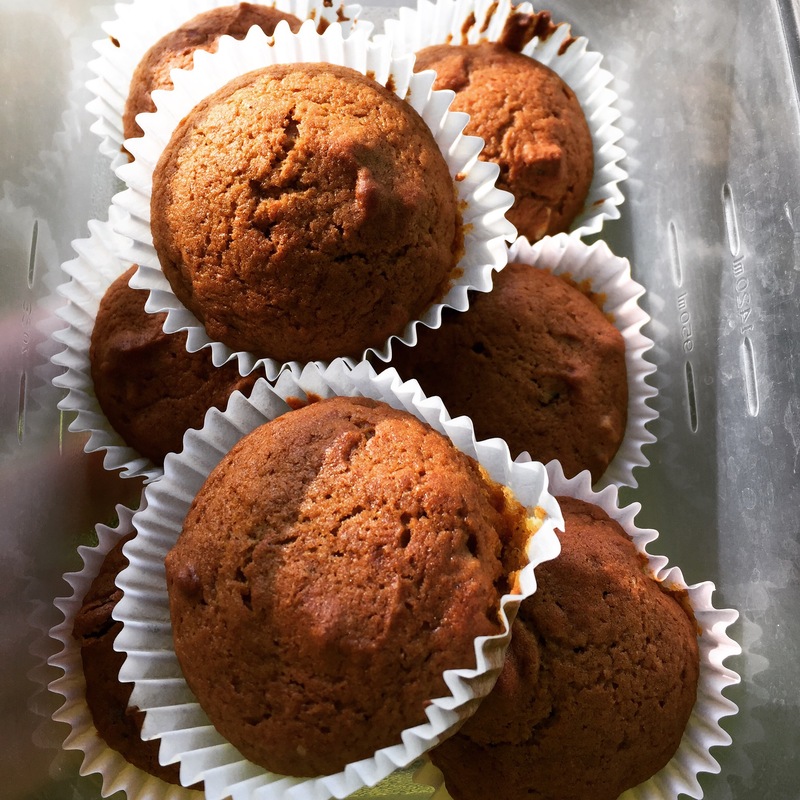 Tasted it and it needed some help…I added 1 ripe mango, 1 medium size yellow tomato, 1/2 of a grilled peach, 1/2 a grilled nectarine, 1/2 a lime, 1&1/4 tablespoons course salt, 1 small roasted red pepper, 1/2 of a green onion, 1 teaspoon of cumin, 1/2 teaspoon of smoked paprika, 1/2 teaspoon of chili powder, another small magi and another yellow tomato. Then and only them did it Taste good enough to eat. 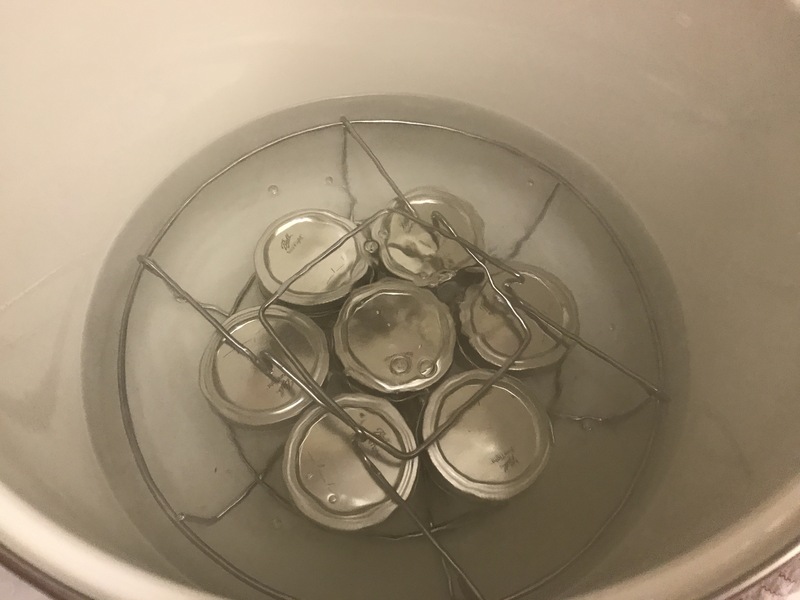 Then I canned some of it! We will have some for this winter! So I am not a vegetarian but the wife is. We thought we would give vegetarian pulled pork a whirl. Well I cheated. I bought a bag of Morning Star pulled pork. Added a bottle of Stubbs Hickory Burbon sauce and thru it in the pressure cooker with a cup of veggie broth. 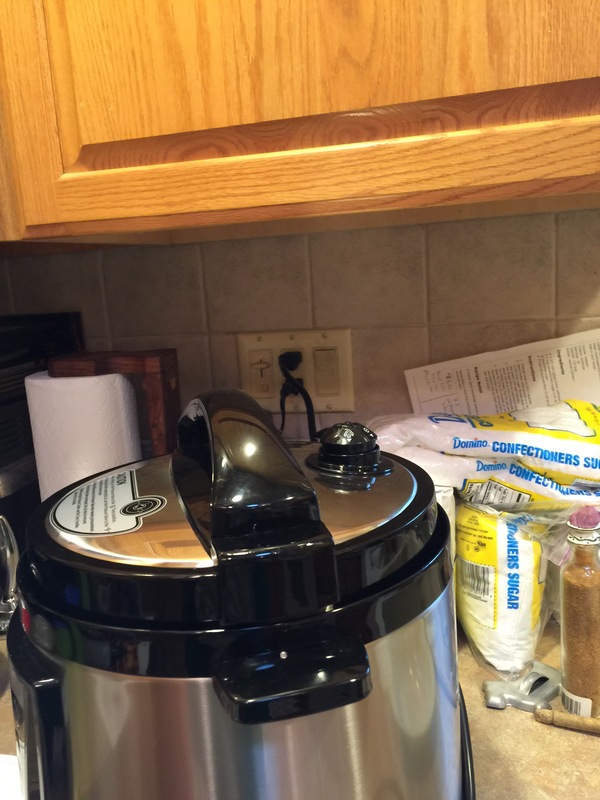 Pushed the chicken button on the pressure cooker and waited for it to come up to the right pressure. 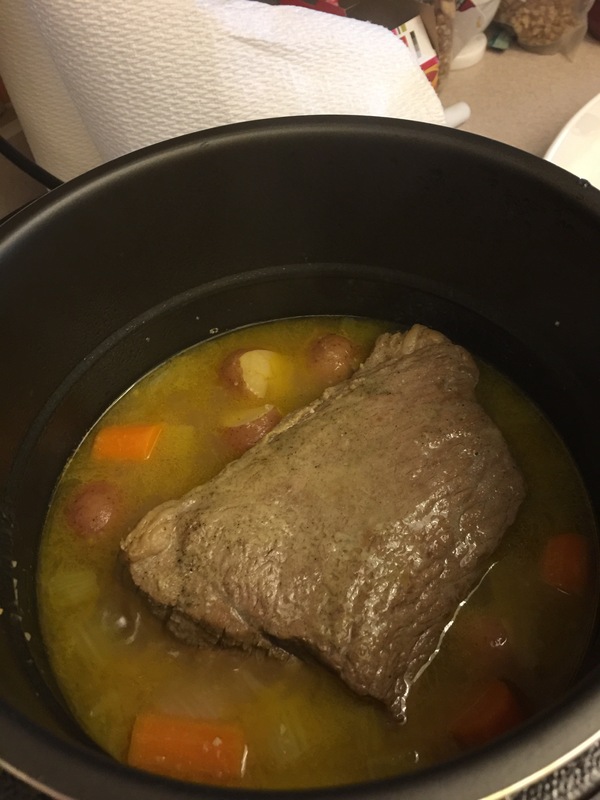 It cooked for 22 minutes. 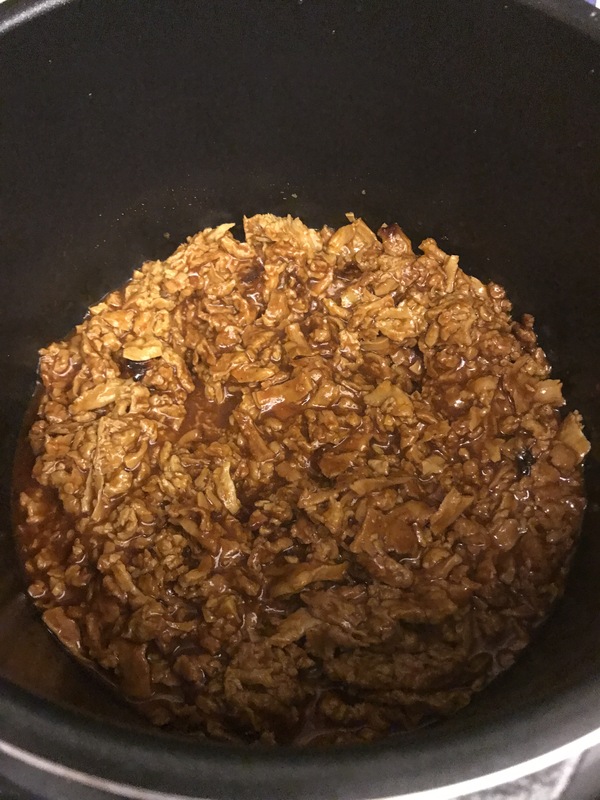 Released the pressure and…..
Smelled just like pulled pork! She ate two sandwiches:0) we will call this a keeper! What shall I make next? 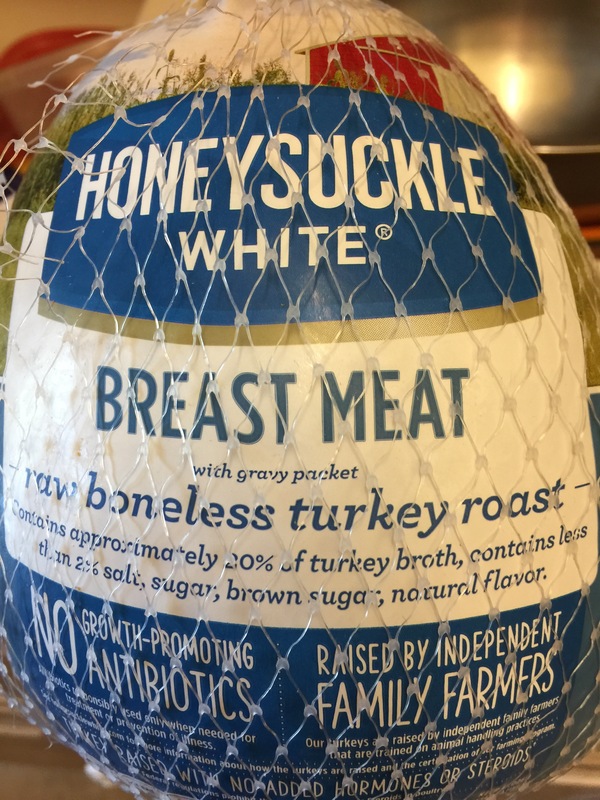 Bought a turkey breast for the pressure cooker! I took the turkey out of the plastic back and washed her off and then but some olive oil and rosemary salt all over her. Threw her in the cooker to brown her a little. 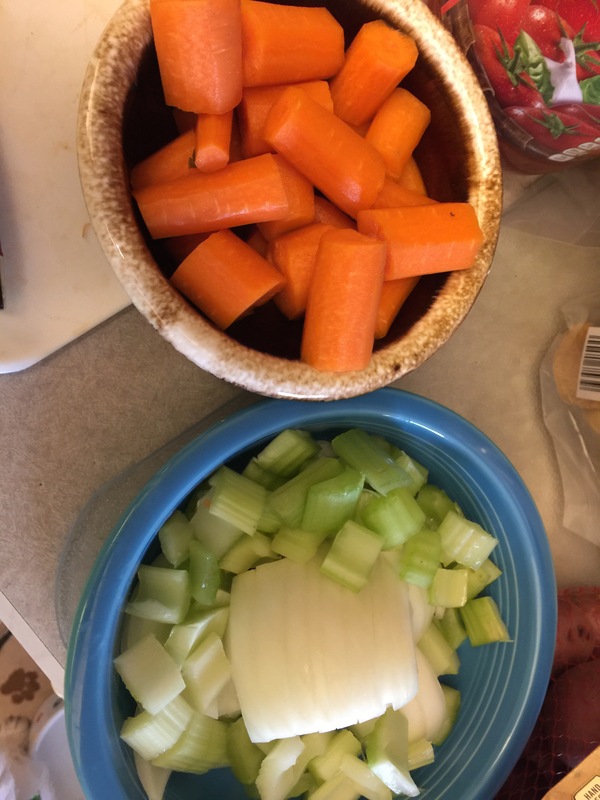 Then I chopped up some carrots, celery and onion for the bottom of the pot. Took turkey out. Turned it off to let it cool down. 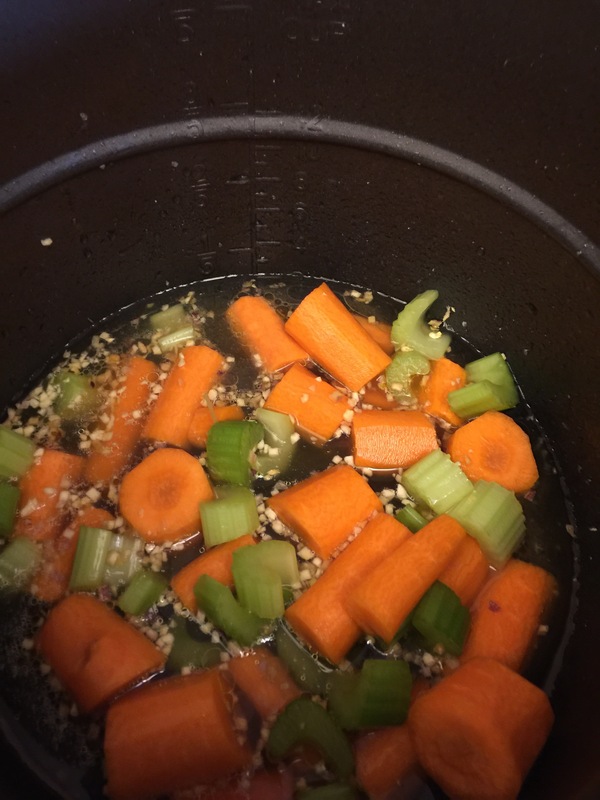 Put the carrots and stuff in the bottom of the pot with 2 cup dish of broth. Sprinkles some dried onion and garlic in there. Turned it on for 30 min. Let it come to pressure and cook. Released the steam took it out and cut the netting off. 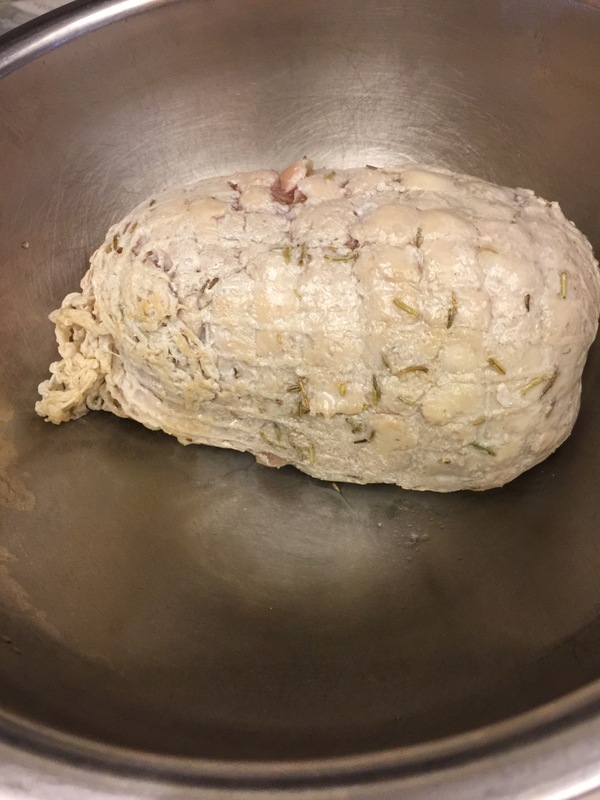 Cut threw the turkey…..not done so back in the pot. 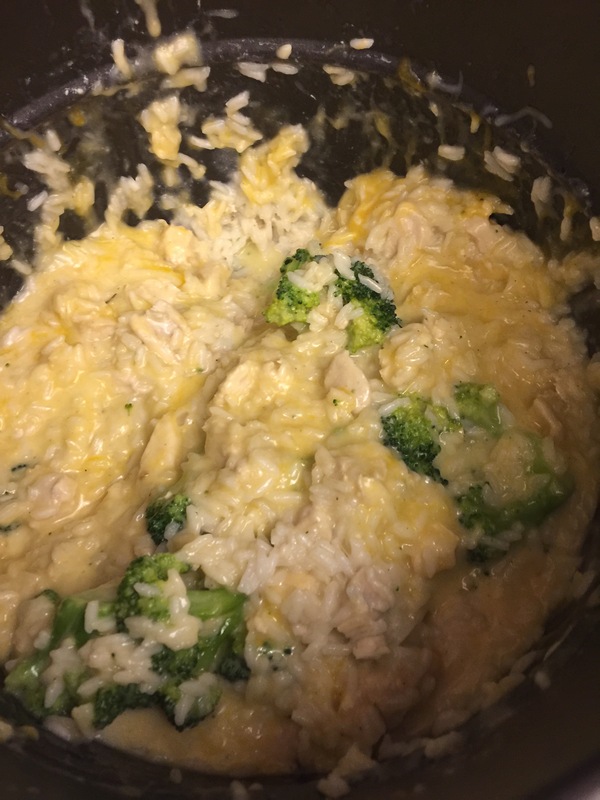 Chicken broccoli & rice is what went in the pressure cooker yesterday. Mighty tasty if I do say so myself. 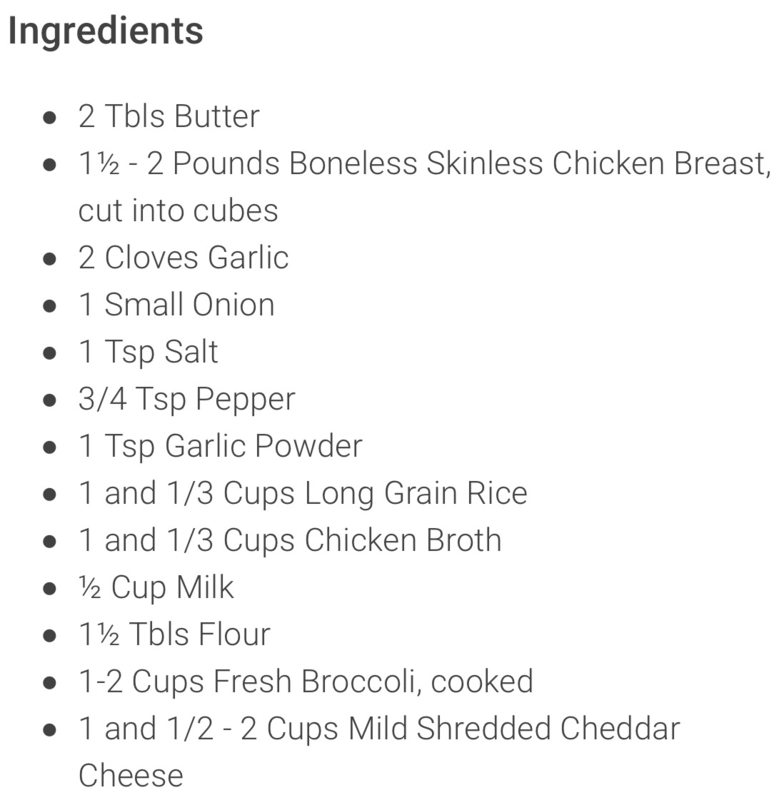 Here are the ingredients and directions. After that is my play by play! Now for what happened while I was cooking. 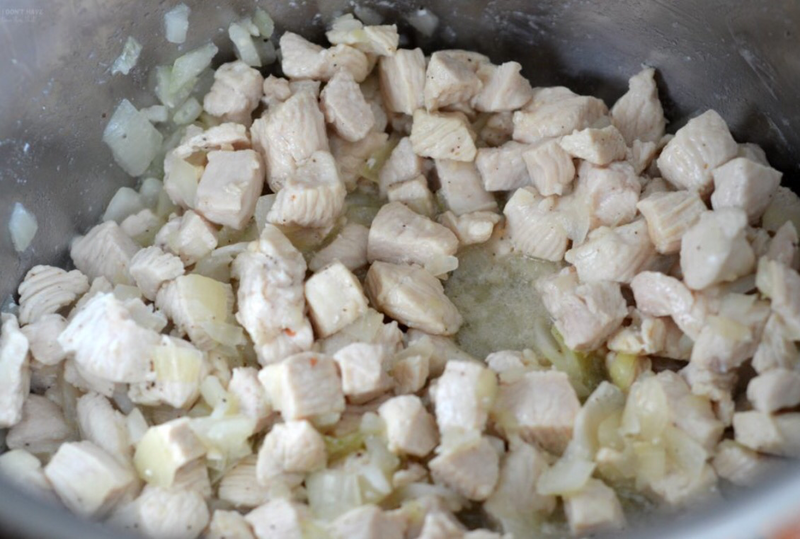 So I cubed up the chicken and cut up the onion. Put the butter in the pressure cooker and turned it on. 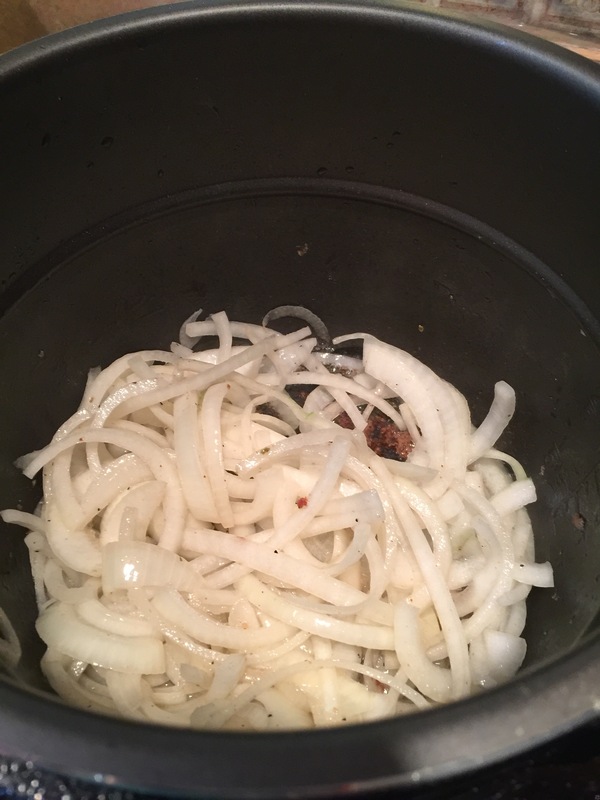 When the butter melted I put the onions in there and let them start cooking. Added some garlic and threw in the chicken and the spices (I added rosemary salt) Mixing it all up as I go. I used frozen broccoli this time (I forgot to get fresh at the store.) put the broth and rice in the pressure cooker and put the lid on. Put the broccoli in the microwave and about 4 minutes in I blew a fuse in the house. 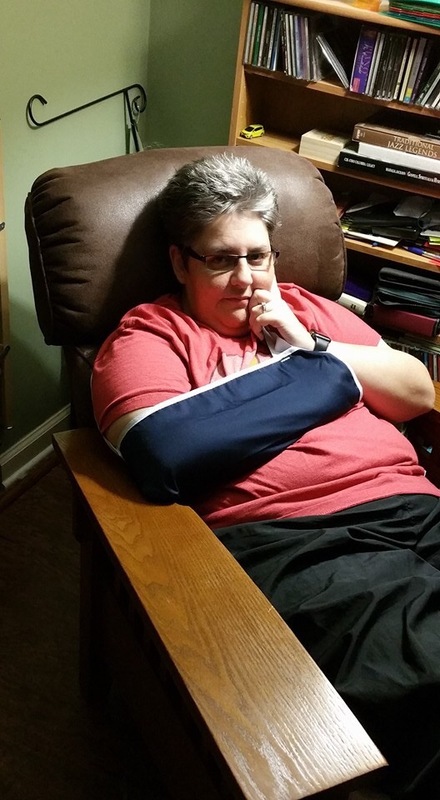 It turned off the pressure cooker and the microwave. Of course there is no one here so I run to the fuse box. Doesn’t look like any fuses are blown and I have no idea which fuse is the kitchen fuse so I throw them all. 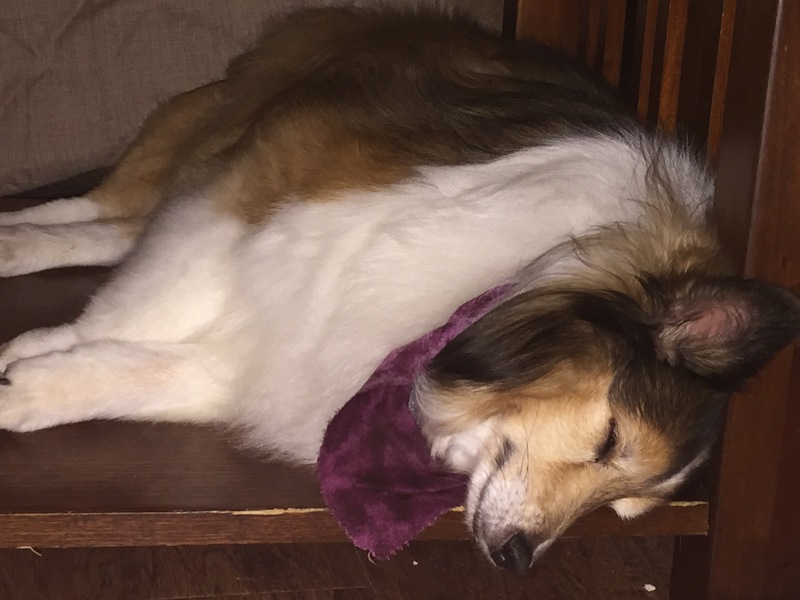 Good idea right…nope, set off the house alarm. Dogs go crazy. I run to go turn that off and rush back into the kitchen. Good news is pressure cooker is at pressure. 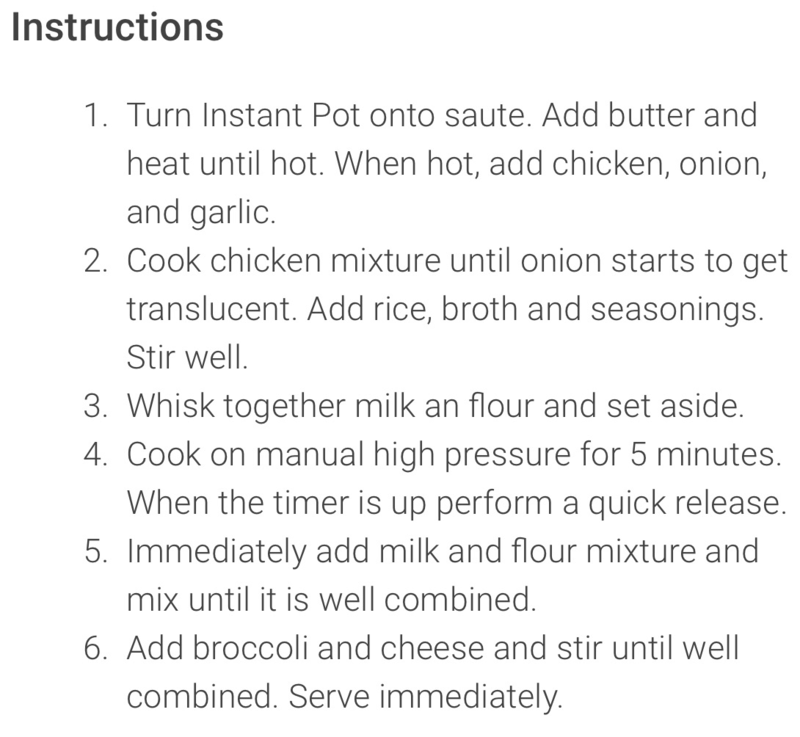 The recipe says to set the pressure cooker for 5 minutes. I haven’t figured that out yet so I set mine to 15 and then stopped it after the 5 minutes. I mixed the flour and milk….oh wait I didn’t have milk so I used heavy whipping cream. I know, but it’s what I had and added a bit of water to it. It worked. After releasing the pressure I added the flour mix and stored it all up and then added the broccoli and the cheese. It was really good! This could be a crowd favorite! Served it right away with a salad! The pot cleaned up easily as well! 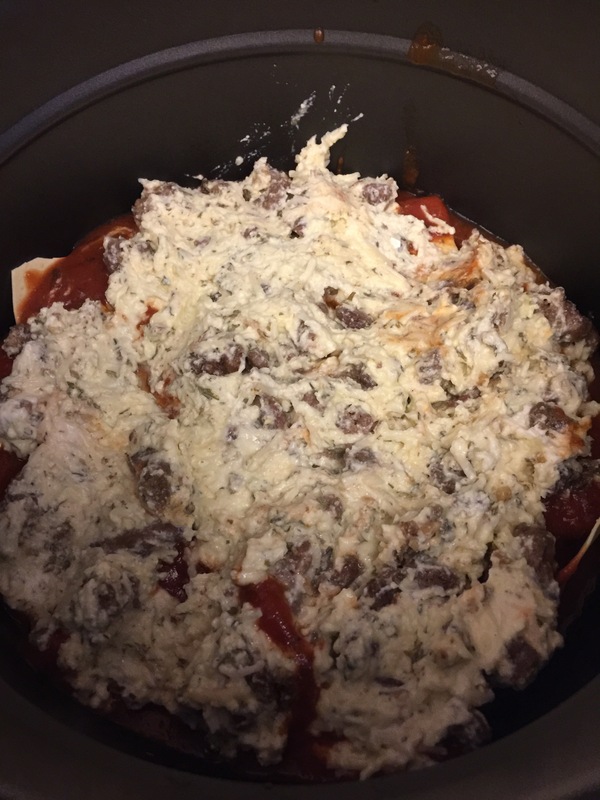 So Pinterest will be the death of me…lol I looked through the recipes and came across several for lasagna. 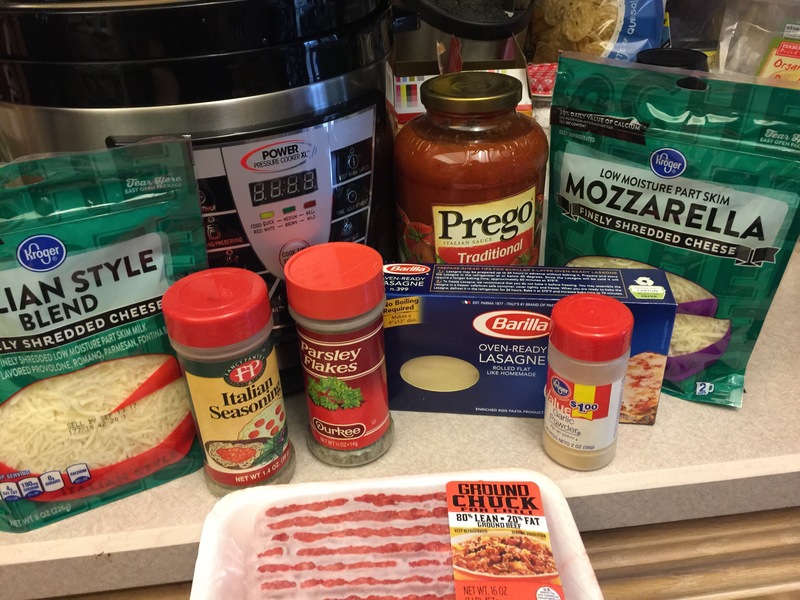 The pressure cooker even came with a recipe for it so…lasagna it is tonight. 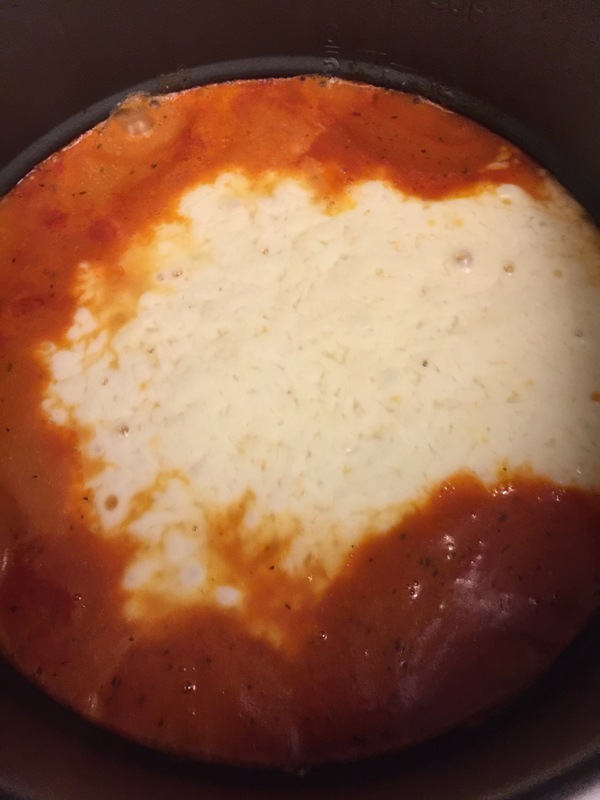 In a bowl mix 2 cups ricotta cheese, a cup of mozzarella cheese, and a cup of Italian cheese. 3 eggs. 3 tbsp of parsley chopped. 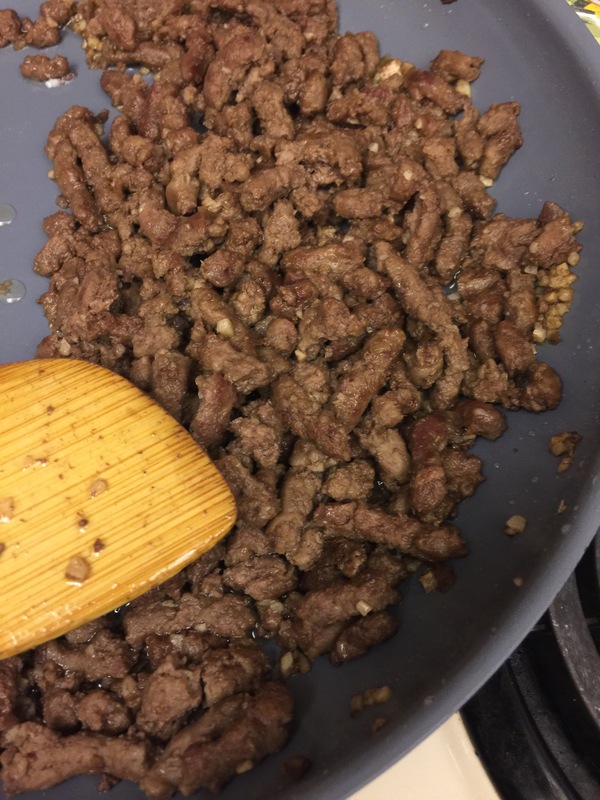 1 tsp of pepper and 1 tsp of sea salt and mix it together. 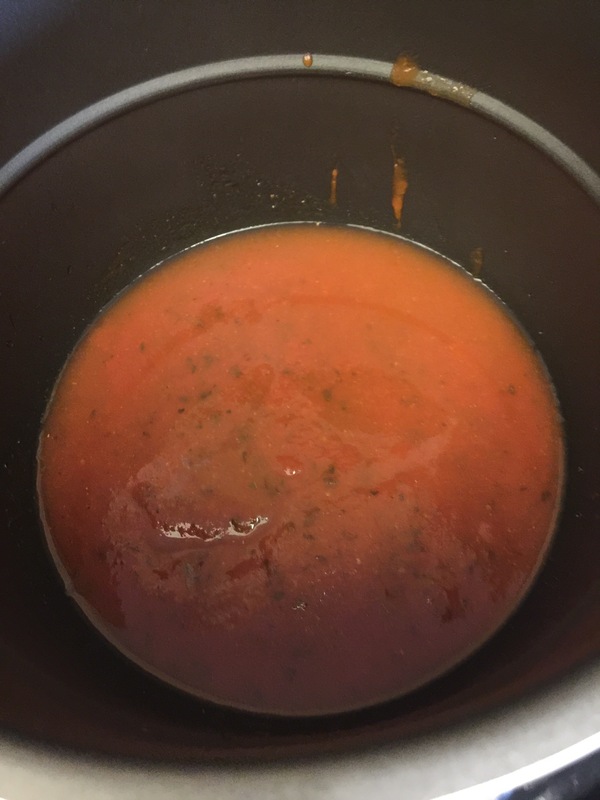 1 cup tomato sauce and half cup of water in the bottom of the pot. 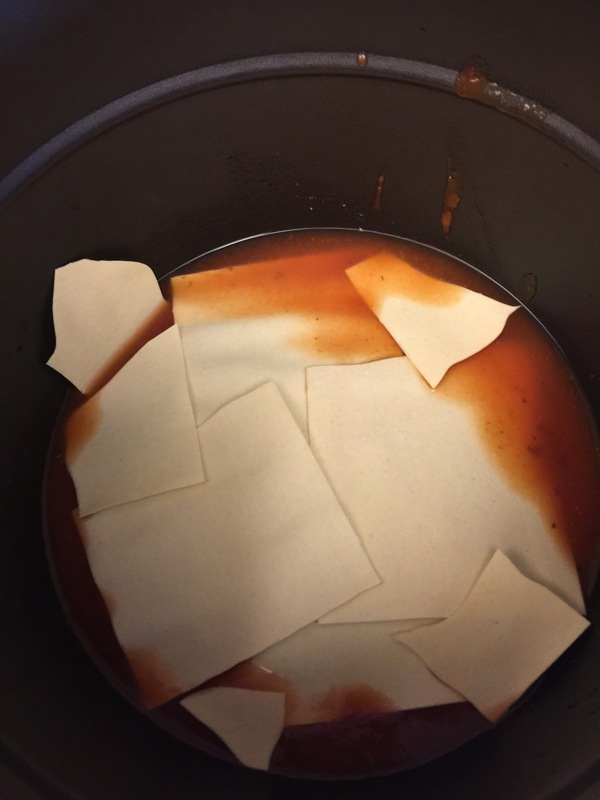 Place 1 lasagna shells in the middle and break two and put along the sides…not pretty but I’ll figure it out I’m sure…. Put the lid on close the release valve and set pressure cooker to soup/stew press time adjust button till it reaches 20 minutes and we wait. Release the pressure valve and let set for 10 minutes and serve! After setting for 10 minutes I searched it with a little garlic bread! This is now a fav! MMMMMM good! Follow up……should add a bit more liquid to bottom on pan it got just a little burnt down there but not bad. Hey everyone! 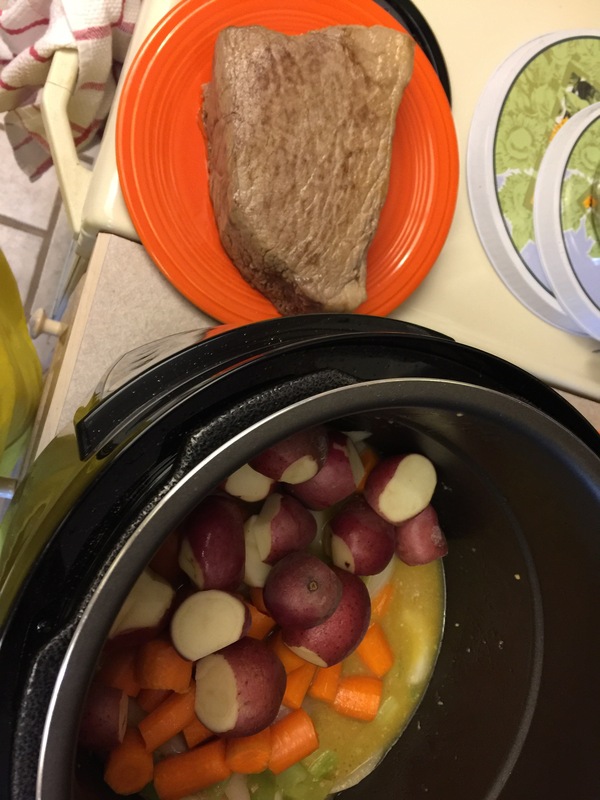 So today I decided to make a roast in the pressure cooker. 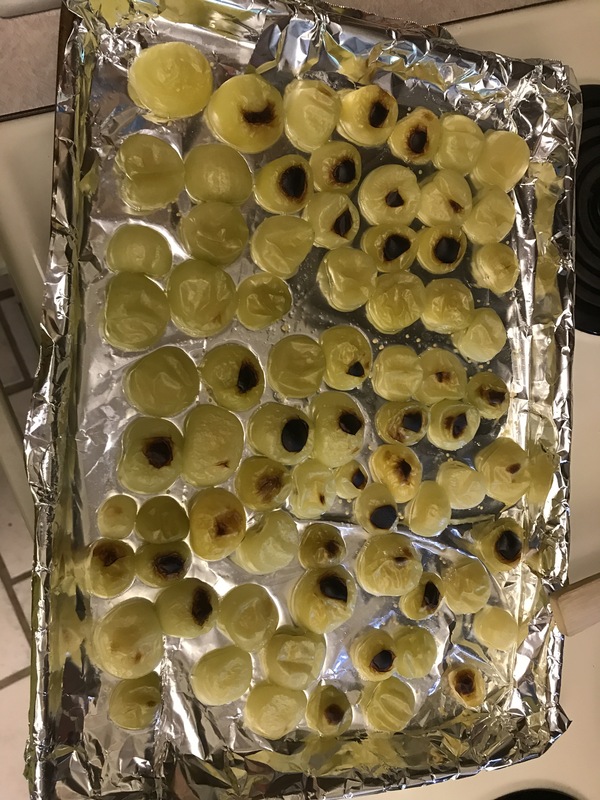 Seared the roast on both sides with some garlic powder on it in the pressure cooker (put in a little olive oil in the bottom of the pan) and took it out. 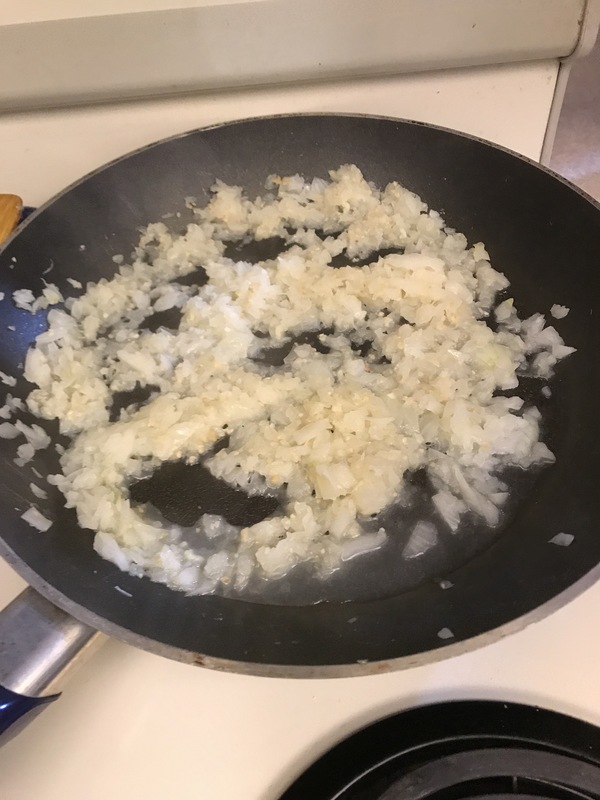 Then sautéed the onion celery and garlic for a little bit. 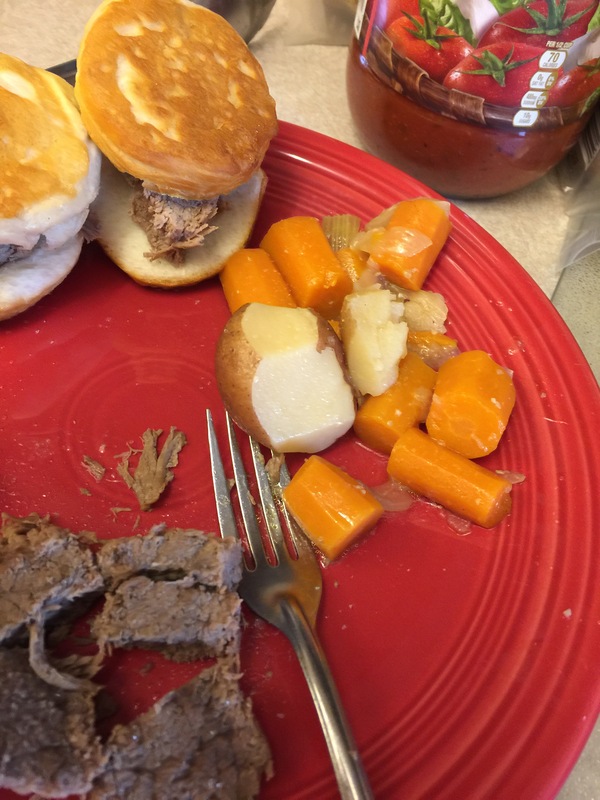 Turned it off and added the carrots and potatoes to the bottom of the pot. Put my meat on top of that. Put some salt and pepper on it and sealed the lid! 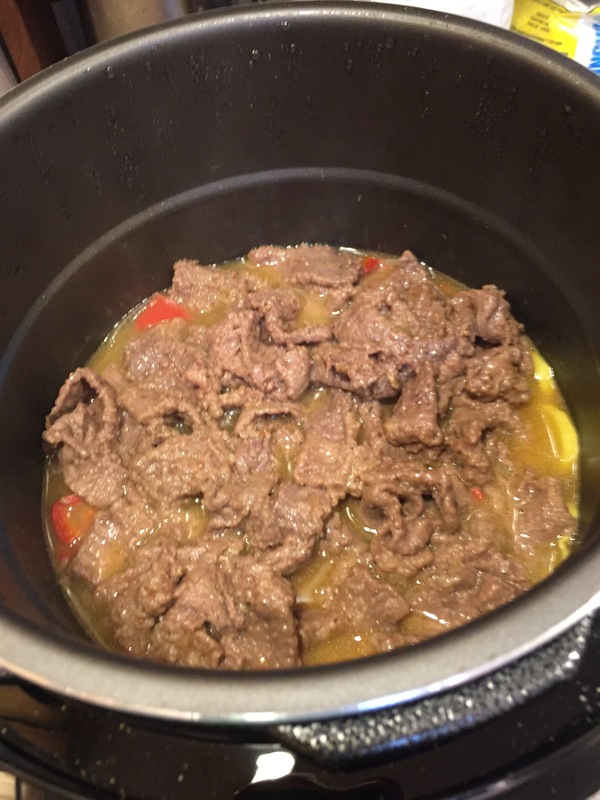 I then hit the cook time selector and made it go to medium. Good stuff! 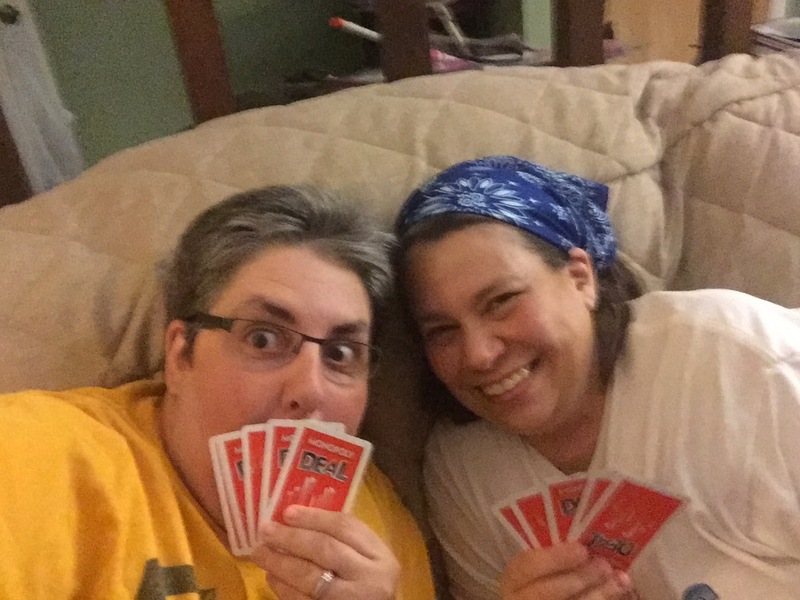 We will so be having this again! 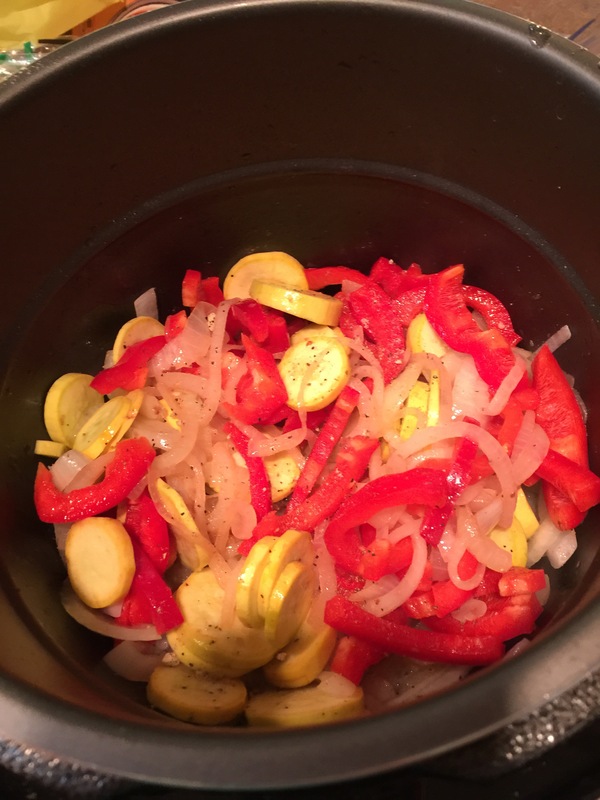 Cut up some red peppers and some squash and threw it all in the pot. 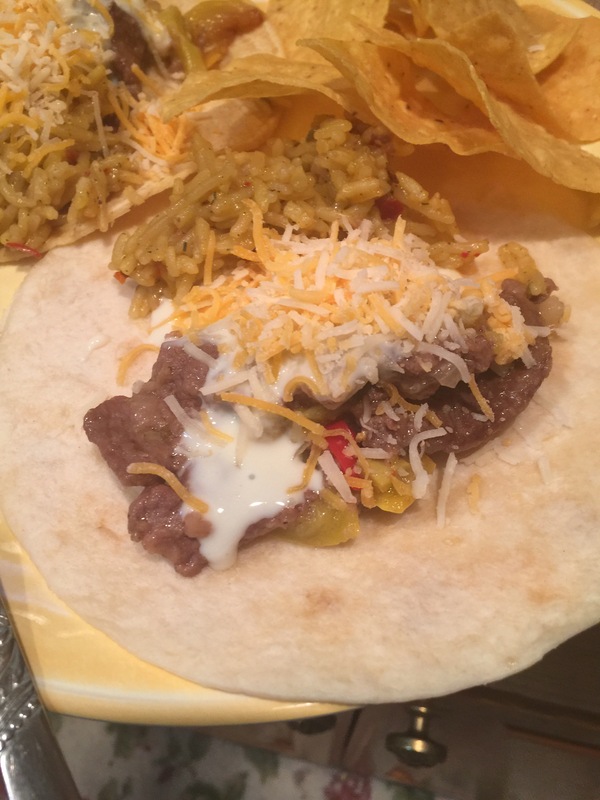 Put some fajita seasoning in it and stirred it up a little bit. 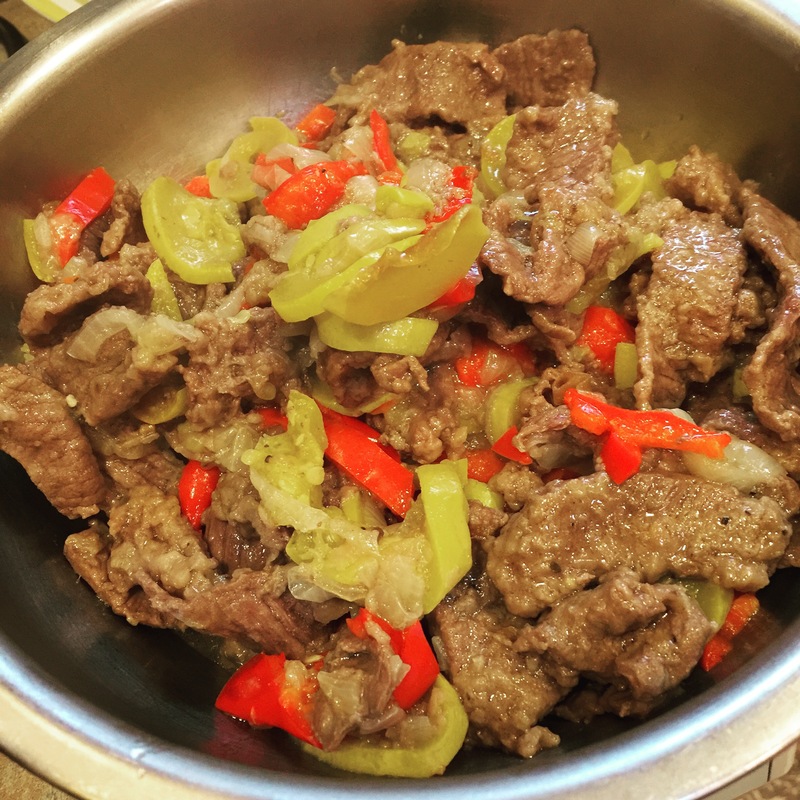 Threw the meat on top and closed up the pressure cooker. I did not put any liquid into the pot. With the veggies and the meat I was hoping it would make enough liquid to steam. Pushed the chicken/meat button again and we waited. 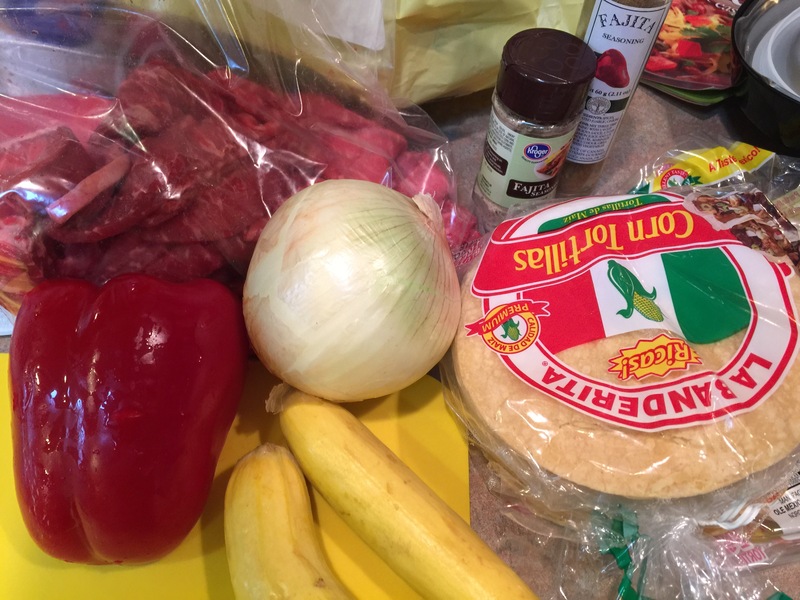 While this was going on I made some Mexican rice as a side and warmed some flour and corn tortillas. When the beep happened I let out the steam. And when that the steam stopped I took off the lid and bam…. 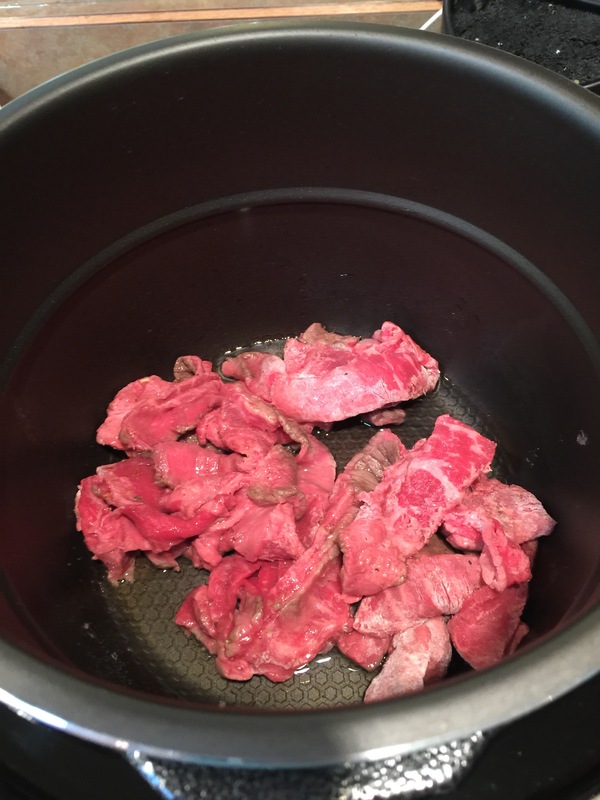 As you can see there is liquid in the pot. It was a good call not to add liquid. Took the mix out of the pot. It was really good! I didn’t put enough seasoning it it (was afraid to over season) but still good none the less. I see it has been a bit since my last blog. Life gets busy quick as most of you know. 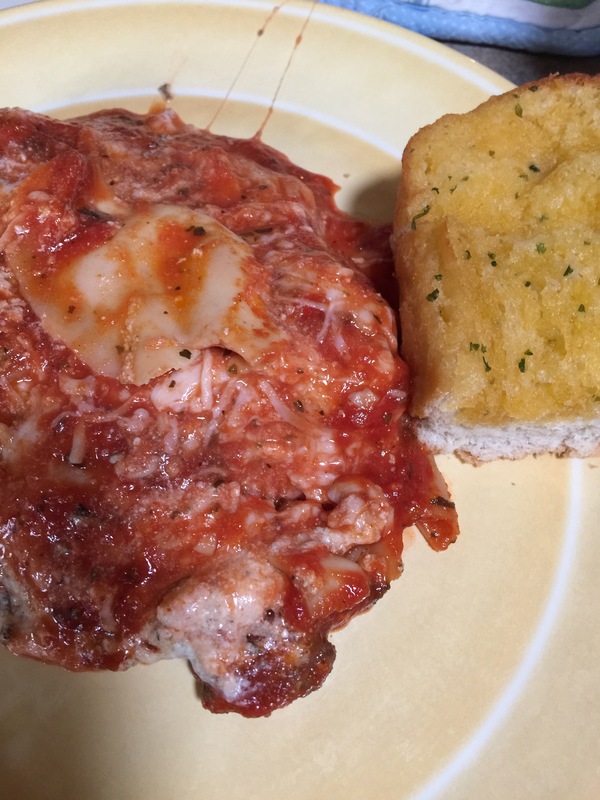 How ever I have been seeing on FB and on Pinterest all these really cool things you can make quickly in a pressure cooker. Then last Sunday we were watching tv and an infomercial comes on with the pressure cooker xl and all the cool things you can make with it. Got the Curiosity up a lot and while out shopping this week I picked one up. 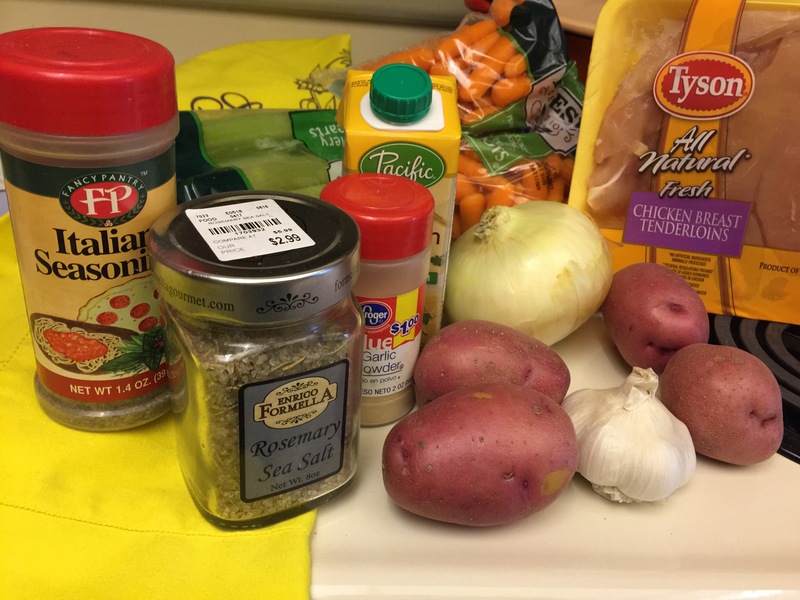 Read the manual (yes I do do that), and went to the grocery to pick up ingredients for my first attempt in joining the pressure cooker family. 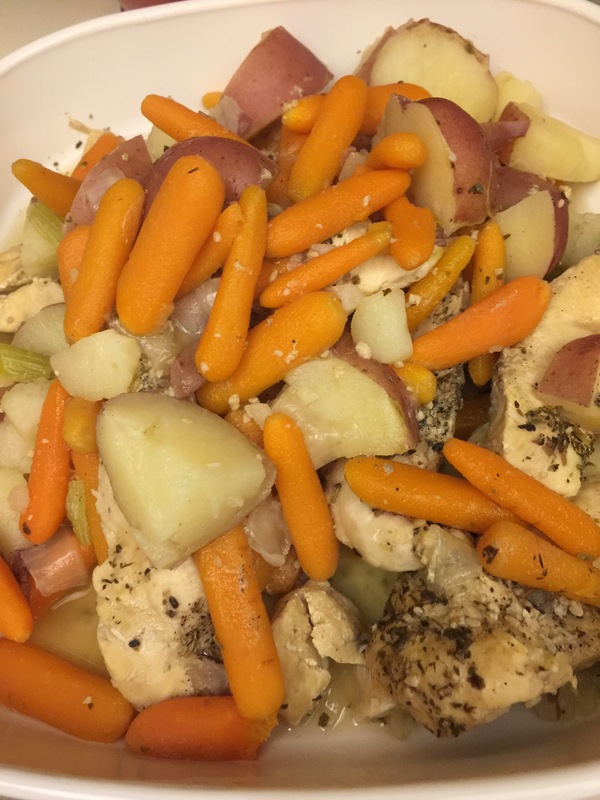 So we are having chicken tenders with carrots, celery, garlic and herbs! I’m also making some dressing on the side to add to the dish. 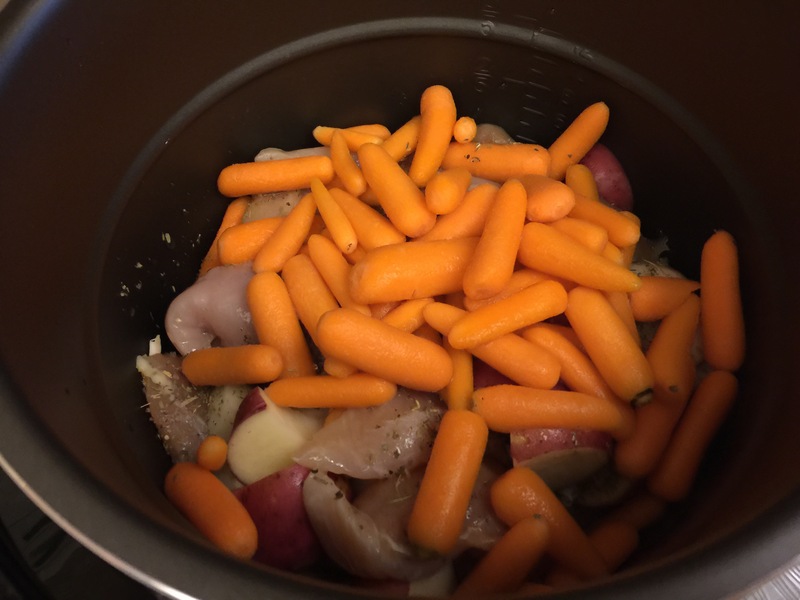 4 stakes of celery, Half of a yellow onion, 4 red potatoes, clove of garlic, a generous portion of carrots, 1 1/2 pounds of chicken tenders and a cup of chicken broth. Threw in some Italian seasoning, rosemary salt, little garlic salt and ground pepper. Just enough rosemary slot and pepper to cover the tenders. This was the most tender chicken I have ever eaten! 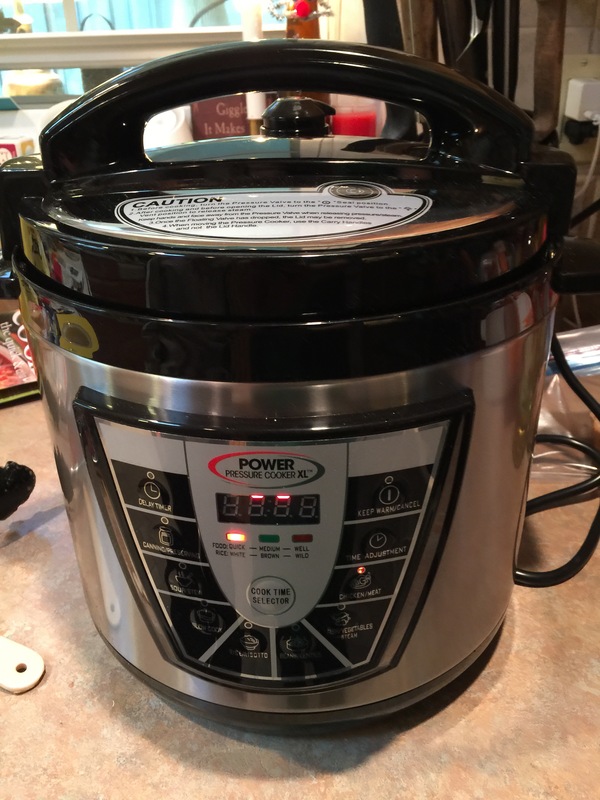 I’m in love with a pressure cooker! I think turkey breast is next on the cooking front! Happy Fall everyone! Hope we get a lot of color here in the 937. I’ll keep ya posted!